Dancing in the Rain – Beware the Comfort Zone! Rainy season has officially begun. Our rainy season is a bit different than the stereotypical Asian monsoon, dumping feet of rain in hours for months on end, and for that I am eternally grateful. We live in the rain shadow of Mt. Apo, which blocks most of the incoming storms, but she’s not invincible, and a few pucks slide past the goalie’s net. These storms unleash the true fury of God’s power, and while fun to watch from inside, are not much fun to get caught in. Unless you just make the best of it. Last Tuesday, Vergie and I were doing our weekly visits to the homes of our Saturday kids. It was overcast, but nothing unusual. Then it started. One drop, two drops…thick, heavy drops, and we knew we were in trouble. Two drops is all the warning you usually get before the skies open. We ran back to her house to attempt to wait it out. Sometimes these storms last two minutes, sometimes two hours. We sat in her living room, watching an action movie dubbed in Tagalog, and waited. As the alley way outside began to fill with dirty water from the overflowing drains, I knew it was time to get moving. By the time I left, the dirty, stinky water was ankle deep. As I shuffled down the narrow walkway to the wider street, I diverted my thoughts away from what the discoloration in the water was, what was bumping my foot, and what the odd smells were. I was cringing, knowing for sure I was now exposed to every disease in the book, and all I could do was keep walking forward. When I turned the corner at the main street (which was also flooded), I entered a street party. Instead of hunkering down inside, everyone was outside, gathering rainwater in buckets, showering under the downspouts, making the most of the “blessing” that was the rain. Kids were jumping in the river (I wish I could say they were jumping in the puddles, but well, there weren’t any, just rivers…), laughing and screaming. I couldn’t help but smile, realizing that so often we grumble past God’s blessings, in search of the next great thing. Sometimes we need to stop and simply dance in the rain. Yeah, cliché, I know…but most clichés speak truth. As I neared my parking spot, the rain stopped, the clouds parted, and the waters began to recede. Once I got home, I showered off in my nice, warm, indoor shower, and remembered to be grateful for every blessing God sends our way. Then, I also remembered to take my semi-annual deworming pill…just in case. No…this is not me. 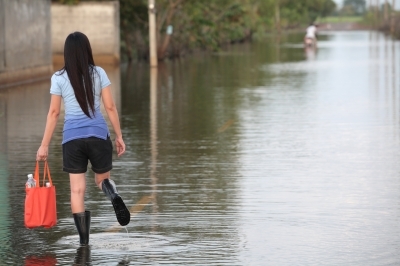 This girl was smart and wore rubber boots while wading along the road. I chose to wear sandals. I think a rubber boot purchase might occur in the not too distant future. But mine will have polka dots. Definitely polka dots. Previous Post What Makes a Missionary? Next Post Cue the Obligatory Cat Photos!